“When you go to a school and a church it sticks with you…it grows on you and you feel that you were part of something.” –Helen Kugler, former parishioner at Saints Cyril and Methodius, about her experience at the parish school and church (2010). Slovak immigrants came to south Bethlehem in search of jobs in local industries. 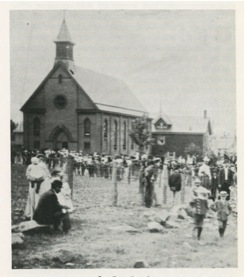 Believing there was a need for a Slovak church, Monsignor William Heinen of Mauch Chunk purchased land from Lehigh University in 1891 and opened the Church of Saints Cyril and Methodius. The Monsignor sold off parcels of the remaining land to parishioners, creating a Slovak community on the Southside. opened to the public in 1906 on Pentecost Sunday. The old building was converted into the parish school that opened three years later, and another larger school building was constructed in the mid-twentieth century to accommodate a growing population of baby boomer students. 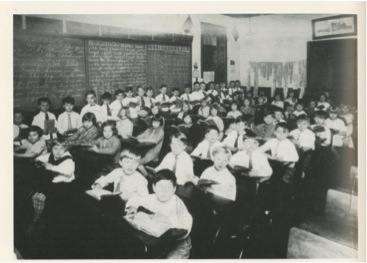 In the 1970s and 1980s the school also incorporated students from other ethnic Catholic parishes as the Italian, Slovenian, and Hungarian parish schools closed because of declining enrollments. “Saint Cyril’s,” the first Slovak church in the diocese, actively preserved its ethnic culture in Bethlehem throughout the twentieth century. A Slovak mass was offered to parishioners until the church’s closing in 2008 and the parish had a Slovak folk group, called Tatra Slovak, which was formed in 1977 and sought to preserve and celebrate Slovak culture in the form of dance, costume, and song. The parish school also taught lessons in Slovak, with students learning the language from a reader called a chitanka. They were expected to greet their pastor in the language. For more information on Slovak in school, see the video to the right. Saints Cyril and Methodius was one of five churches that were closed and consolidated by the Diocese of Allentown in 2008, as the number of active members declined. That same year, the church building reopened as Incarnation of Our Lord, a blended parish made up of members of the five consolidated ethnic churches. John Vadumsky, a former parishioner at Saints Cyril and Methodius, discusses changing funeral practices at the church. 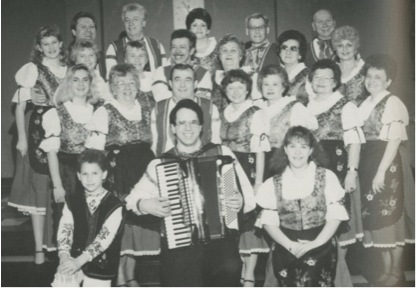 The Tatra Slovak folk group, 1991. The folk group sought to preserve Slovak culture through song, costume, and dance.